Description: This hearty little Field Sparrow was fluttering in mid air after the gnatlike, winged insects that were about yesterday in the comparatively warm low 30's. When he caught one, he hacked a bit, expelling wings perhaps, but got it down. Otherwise, he was sucking on blades of grass. One tough little cookie. The Field Sparrows frequent overgrown fields, pastures, and forest clearings. Mid-October is their peak migration through Michigan. They winter in most of the south eastern states below Michigan. Pay attention to flocks of sparrows under feeders. 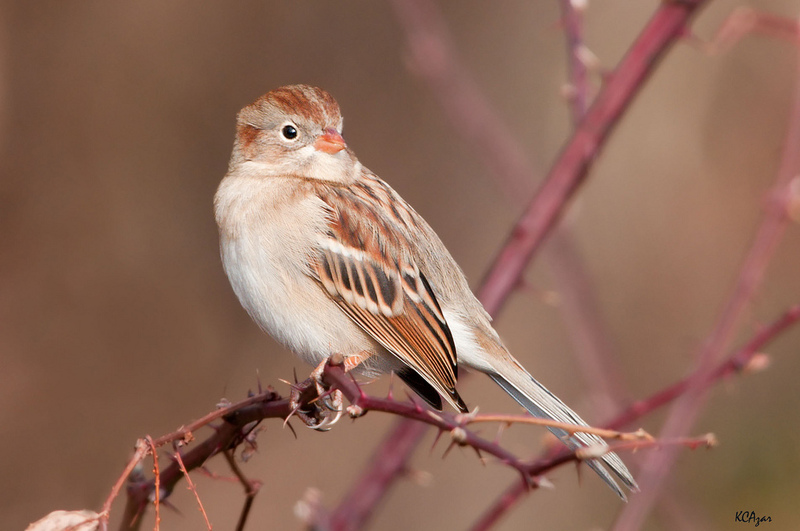 Look for smaller, warm-colored birds foraging near the ground. They may migrate in flocks that contain multiple species of sparrows.